From burned-out executives to those seeking a balance between family, work, and ministry, every busy Christian will appreciate an inspiring message from One Minute Bible. Produced by the editors of Leadership Magazine, this Bible lifts up passages of assurance that bring God-given calm amidst the hectic workaday world. Commentaries are written by Christian leaders such as John Maxwell, Os Guiness, and J.I. 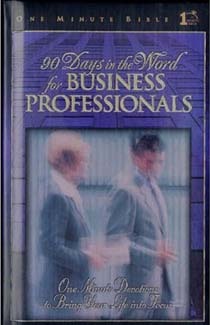 Packer, as well as internationally known leaders like Peter Drucker and George Gallup, Jr. Each contributor celebrates God's constant presence in the workplace and guides readers to professional success through practical applications.